We are gearing up to make Palladium bigger and better. We are working like mules to get new releases out one, two, three, four. And to keep them coming fast. Everything in the pipeline is nothing short of awesome. The quality level is top notch and the creativity is reaching new heights. I swear, it seems like the artwork is all better than ever, the ideas cutting edge and powerful, the support and energy from creators, electric. 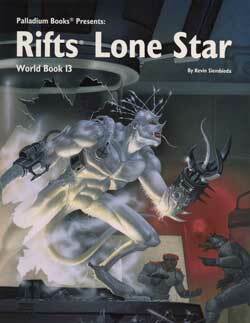 Rifts® Vampires Sourcebook is at the printer. I approved the digital proofs of the cover and interior pages on Monday. The book looks great and the printer confirmed the book will be ready to ship next week Friday, April 12! 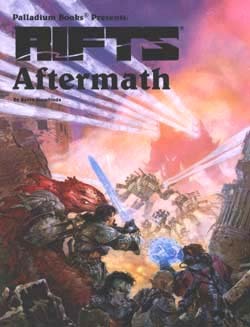 Remember, Rifts® Vampires Sourcebook is now a BIG 176 pages ($20.95 plus shipping) filled with source material you will want to own and read. And yes, that includes the Experience Tables for Vampire Hunters and Reid’s Rangers. 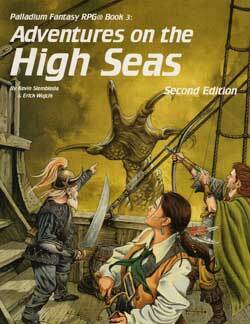 Get a free sneak preview of it on DriveThruRPG.com – and get those orders in. All pre-orders ship the day the book hits the Palladium warehouse, even before we ship to distributors. Game on! 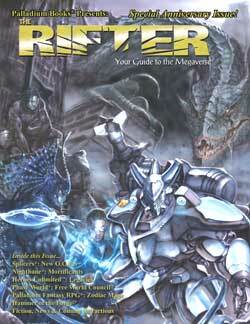 Wayne and I have been working like crazy to get this issue of The Rifter® wrapped up and to the printer. We’re fooling around with its content right now, so we can’t reveal it just yet, but I think vampires and fantasy and nostalgia will play a big role in it. 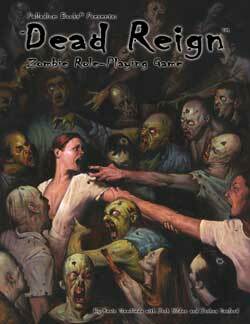 It will include additional and “official” Rifts® Vampires source material that we could not squeeze into the sourcebook, and other good stuff. 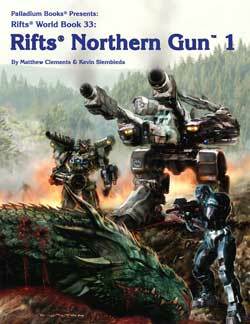 Art continues to roll in for Rifts® Northern Gun™ One. I’ve only done a little work on it this week, as I have spent most of my time this week working on The Rifter® #62 and catching up on other business matters. I need to clear my plate so I can work on NG-1 non-stop all next week. This book is a beauty. Work continues on Northern Gun™ Two and other projects as well. I approved the manuscript outline for a 96 page Robotech® sourcebook with new writer Jim Sorenson, best known for his books on the Transformers. It sounds excellent. ‘Nuff said for now. The sculpts for the finished Zentraedi Officer’s Pod and Valkyrie in Battloid Mode just came in, along with a few others and . . . WOW. Harmony Gold loved ‘em too, because they have been approved. All sorts of work is in the completion stages for this dynamic product line. As I have said, this is a massive undertaking and it takes time to get it done right. 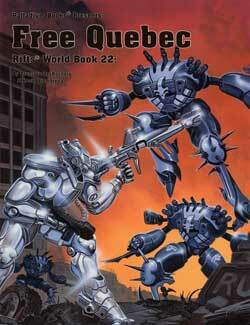 And that’s what everyone at Palladium Books®, Ninja Division, Harmony Gold and Robotech® fans want. Our goal is to produce game pieces, rules and an expanding Robotech® game line that will make fans smile with delight and provide hours and hours of new gaming experiences. The Robotech® RPG Tactics™ Kickstarter is coming. This will be a Palladium Books® Kickstarter, but Ninja Division is doing the heavy lifting since they have the superior experience. As soon as these outstanding gentlemen have everything in place to make a rockin’ Kickstarter, we will launch. It is still planned to start mid-April. Yes, that means in something like the next 10 days. We will keep you posted. Megaversal Ambassadors Wanted – that could be you! Thanks to the efforts of several new, motived Megaversal Ambassadors, the program is expanding and we need YOU. If you’re a good Game Master, enjoy introducing new people to gaming, and like running Palladium games and demonstrations, we encourage you to join the ranks of the Megaversal Ambassadors. As Palladium makes plans to grow and reach more gamers, your efforts to spread awareness matter more than ever. Through your efforts we can introduce more people to the fun, Palladium role-playing game experience. And involving them in great games at stores, conventions and other events is one of the best ways to do that. 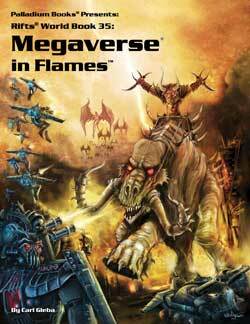 In fact, we are working on a variety of ways to make this website more fun and to introduce people to the Palladium Megaverse® of role-playing games. We are even kicking around establishing demo teams and organized play events (with the help of Ninja Division) for Robotech® RPG Tactics™, and there is no telling where else that may lead. It is time for us to pull out all the stops with dynamic new product, fun and games! And you can be part of that. My birthday was April 2nd, and I was feeling a bit blue. Not sure why, especially with so many exciting products in the works. Then came a deluge of birthday well wishes from dozens and dozens of friends and fans via email, private messages, Facebook posts, and telephone calls. It was great hearing from all of you, including some old pals. Thank you very much. Let me tell you, that chased the blues away. I enjoyed a quiet evening with Kathy and I’ll be celebrating my birthday and Julius’ with the Palladium crew April 12, the same day Rifts® Vampires Sourcebook ships. I’ve also been in contact with Mike Mumah, who is working hard at rehab and whose spirits are excellent. That’s it for now. Game on. 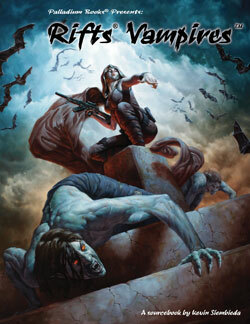 Rifts® Vampires Sourcebook™ is at the printer. I’ve approved the printer proofs and the printer has confirmed the April 12, 2013 ship date. 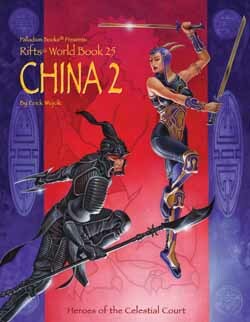 If you like the original Rifts® Vampires Kingdoms’ characters and settings, you will love this much expanded and updated source material. And there is so much that is brand new. It is time to place your orders. 176 pages – $20.95 – Cat. No. 884. At the printer. Place your order. Rifts® – Vampires Sourcebook Bonus Material – Some of the awesome stuff we couldn't squeeze into the sourcebook! Rifts® Black Market Experience Tables. 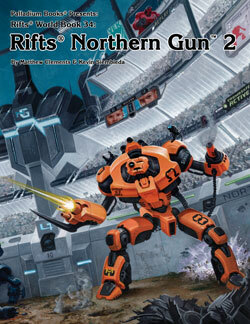 Rifts® Northern Gun™ Sneak Preview.